Worker B body product giveaway! Want to win one a lovely Lotion Bar like this from Worker B? A couple of Minneapolis farmers market friends of mine recently started a new company called Worker B. Worker B makes handcrafted lotions and balms here in Minneapolis using organic, high quality ingredients - never any fillers, synthetics, or preservatives. They use exclusively raw honey, beeswax, organic extra virgin olive oil, organic almond oil, organic avocado oil, vitamin E, propolis tincture, and organic essential oils to create their fabulous products, which range from hand lotions to lip balms. Not only do I enjoy their philosophy and products, I am totally in love with their slick branding and packaging look, which was designed by a local Minneapolis agency. Worker B is available online, as well as at a number of Minneapolis retail locations and farmer's markets. These guys get around! After spending the summer pestering them every week at the Farmer's Markets around town, I've now had the opportunity to try a number of their products. I liked how they felt clean and pure, and I was able to tolerate them just fine, even with my skin sensitivity. My favorite is the Lotion Bar (pictured above), a rich and nourishing balm that keeps my hands and elbows soft, even after long days in the garden, long nights in the clay studio, and dry Minnesota winters! Lucky for you, the generous folks at Worker B were kind enough to give me two of their lotion bars for a giveaway! I've been holding on to them since October, just waiting for the cold winter months where we're all desperate for a little skin-nourishing moisture. Two lucky readers will each receive one bar! Do one or all of the following to enter - the more things you do, the more chance you have to win! Only U.S. and Canada shipping addresses are eligible. I will select a winner for each bar through a random number generator. Good luck! Leave a comment on this post telling me your favorite way to stay soft and smooth in the cold winter months. Share this giveaway on Facebook and link back to this post (http://tinyurl.com/workerb), and leave a comment below that you did. Become a "fan" on my blog's Facebook page and leave a comment below that you did. Become a "fan" of Worker B on Facebook and leave a comment below that you did. Please make sure you leave an e-mail address when leaving your comment so I can contact you if you win! Contest closes Monday, January 24, 2011 at 11:59 pm CST. Winners will be announced Tuesday, January 25, 2011. For more information about Worker B and to shop their online store, please visit their website: www.worker-b.com. THIS GIVEAWAY IS NOW CLOSED. SEE ANNOUNCEMENT OF WINNERS HERE. Homemade natural mouthwash is effective, affordable, easy, and tasty! I make most of my own body products from very basic, simple ingredients. One thing I've changed in the last year is going from using natural store-bought toothpastes to using tooth powder and homemade mouthwash. I use pascalite clay and baking soda to brush my teeth, and it works like charm. My dentist even commented that my teeth look better than they did at my last visit (I didn't tell him I stopped using toothpaste). I love how smooth my teeth feel from the gentle abrasion of the clay and baking soda. The one downside of pascalite clay is that it tastes like clay. Sometimes I add a drop of peppermint or tea tree oil, but it still has a very strange, clay-like flavor that doesn't feel so "fresh". I wanted a minty rinse after brushing to wake up my mouth. I also wanted to make sure that any stray bacteria lurking around my mouth - be it Candida-related, Lyme-related, or something generally unfriendly (especially in cold season) - didn't stand a chance. I needed a mouth wash! 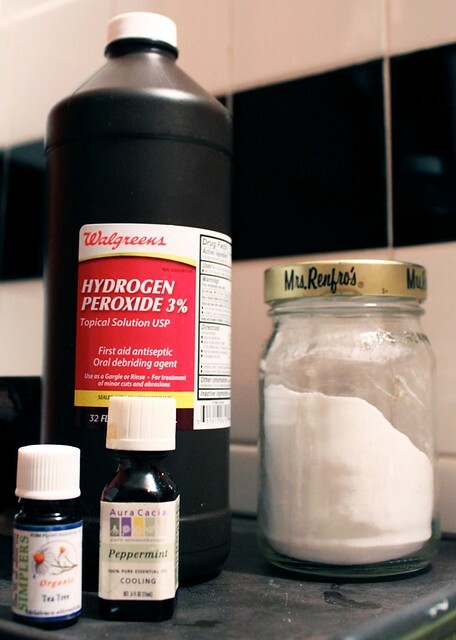 Thankfully, there is a wonderful option that is affordable, natural, and easy-to-find: hydrogen peroxide! Hydrogen peroxide is a powerful germicidal agent. It completes my home remedy holy trinity, along with raw apple cider vinegar and aluminum-free baking soda. I use it for all sorts of things around the house. I add it to my bath water for a detox bath, I add it to foot soaks, I use it to clean wounds and cuts, and use it to disinfect everything from toothbrushes to countertops. I love the stuff. But until recently, I'd never considered putting it in my mouth! After a little internet research and reading the bottle itself, I decided on a combination of hydrogen peroxide, water, baking soda, and essential oils to make an effective and tasty mouthwash. It costs pennies to make, is a breeze to throw together, and helps whiten your teeth (for real!) and clean your mouth. I've had teeth staining from all my antibiotics I take for Lyme Disease treatment, and this seems to be helping clear up some of the grey color, which I'm thrilled about. But whiteness isn't everything, people! Proper mouth hygiene is good for everyone, it is imperative for individuals dealing with Candida overgrowth, Lyme Disease, Herpes simplex type 1, various inflammatory mouth conditions, or other chronic bacterial or viral infections. Oh yeah, and did I mention it's cold season? Keeping your hands and mouth clean will help you avoid getting the winter plague. So, without further adieu, here's my recipe for natural mouthwash. Enjoy! And don't forget to update your feed reader or subscribe by email. Combine in a jar/bottle and shake. Baking soda will slowly dissolve. Then it's ready! When you want to use it, shake it up, then take a swig or a shot glass full of it and swish around the mouth for a minute, then spit out. You can also gargle with it. Do not swallow the mouthwash solution, consuming non-food grade hydrogen peroxide and non-food grade essential oils can be toxic. If administering to children, watch them closely to make sure they don't swallow it. Mixture will store indefinitely. After being told by a reader that all baking soda is aluminum free, I did a little more research, and yes, it turns out that from what I can find online, that may very well be true! Baking soda is nothing but sodium bicarbonate, and by default shouldn't contain aluminum. So, you can probably buy the cheap stuff rather than shelling out the money for Bob's Red Mill "Aluminum-Free" Baking soda - it seems that calling it such is just a marketing ploy to get us to spend more money on baking soda! Any thoughts/experience on this? any opinions/facts to counter it? This is another one of my favorite body scrubs. It uses a blend of organic sugar and sea salt, spiked with crushed lavender flowers and lavender essential oil. Lavender has a great number of healing qualities. It is naturally antiseptic, anti-fungal, anti-inflammatory, and anti-depressant, and has been valued for centuries as a powerful herbal remedy. Lavender flowers can be used whole in sachets or potpourris, can be eaten, and can be brewed in teas, toners, and rinses. The essential oil is very safe for external use, and can be used internally in very small, regulated doses (this should only be done with proper research and dosage). I find lavender to be a soothing, relaxing herb and often use it at home. It is one of the few scents I tolerate, and therefore, I take advantage of it! I like to add a few drops to bath water, make natural air fresheners, and sometimes add it to homemade lotions and creams. I also rub it on insect bites to reduce inflammation and itchiness - it takes away the irritation of mosquito bites in a flash! I also enjoy lavender flowers mixed in teas, and like using it in cooking as well. My favorite way to use lavender, however, it definitely in the bath, and this scrub is no exception. I love this scrub because it makes my skin feel oh-so-soft and is wonderfully easy to make. That said, it is contains a substantial amount of skin-nourishing oil, so it makes your tub a little bit slippery. Be careful while you're standing up in the tub or shower, and make sure to give it a good rinsing out afterward with hot, soapy water. Don't be surprised if your bathtub drain rebels a little bit. Want another great homemade body scrub? Check this one out:Good Morning Homemade Body Scrub. Lightly crush lavender flowers with a mortar and pestle. Add to a bowl with salt and sugar, and stir to combine. Mix in oil and essential oil and stir until evenly moistened. Store in a well-sealed jar. To use, rub a small amount on damp skin in circular motions. Rinse well and pat skin dry. This body scrub is like breakfast: oatmeal, coffee, and honey. The perfect formula for a good morning, right? I know, I know, this is a total departure from food (although you could eat this body scrub if you really had the deep urge to do so). I am hoping to increase the focus of the blog and include more information about natural health, sustainable living, mindful life choices, and all the other DIY stuff I'm into. Don't worry, I'll still have lots of good recipes - I'll just be including other information as well! I reorganized the blog a little to make it easier to follow, and I'm ready and rarin' to get this train moving. So, here we go, starting with something delightful for the bath. Why? Well, in the wise words of the band Phish, "Cause we're all in this together, and we love to take a bath!"